You can also call, text, email or message. See the Contact Me page. I offer Therapeutic Massage to support your optimum health, functionality, vitality, and strength through relaxation, stress reduction, pain relief, alignment, improved sleep, digestion, immune function and more. I use Swedish and Deep Tissue techniques including Myofascial Release and trigger point release and suggest clinical stretching and strengthening exercises and self care to support improvements between massages. 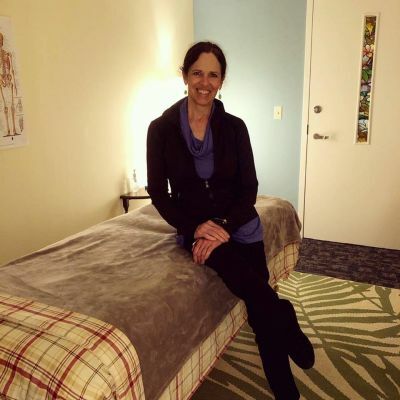 I’m experienced in massage for chronic pain, overuse and accident injuries and Oncology massage, TMJ Disorder Intra-Oral therapy and am a member of the Maine Sports Massage Team. I also love giving luxurious Relaxation massages. See the valuable benefits to relaxation below. My passion is helping people feel their best. I appreciate the uniqueness of each client, with his or her individual nature and love helping them achieve their goals. I enjoy working with a variety of people including seniors, athletes, those with pain from overuse or injury, complex medical conditions, people with different abilities and those in recovery. I also practice Shiatsu, a form of Japanese acupressure, which enhances flow in the body’s meridians and restores physical, mental and emotional balance. For more about how it works, see the Services & Rates page. I'm a Reiki Master practitioner and teacher. In addition to the option of receiving a full-body Reiki session, this energy work can be incorporated into massage sessions. It's also useful for local contraindications for massage such as contusions & fractures, surgery & port sites, inflammation, blood clots, and lymphedema. See more about how it works on the Services & Rates page. Swedish and Deep Tissue: By releasing tension and restoring balance to soft tissues (muscles, tendons, ligaments, and fascia), many new or chronic issues can be relieved: headaches, jaw pain, numbness or pain in forearms and hands, as well as pains in the neck, shoulders, back, hips, gluteals, legs and feet. The Relaxation and mood-lifting components of massage are just as important as pain relief. Relaxation feels wonderful! Also, when muscles are relaxed, they are less likely to press on nerves and blood or lymph vessels. With the "pressure off", the physical, mental, emotional and spiritual body is usually freed to operate in happy harmony. Oncology Massage: Benefits for people who have or have had cancer include deep relaxation, pain relief, reduction in depression and anxiety, improved sleep and many more. Depending on the condition, treatment, timing, lymph node removal, and how the client is feeling, adjustments are made to ensure optimum experience and benefits. "Kate does a great job with massage, using a great mix of methods to suit your needs. She truly cares about her patients and does her best to meet all their needs." Cindy P.
"I loved the entire experience and felt so much better afterwards! It was the best hour of my entire life! I felt great afterwards." (Reiki) Ceanne L.